How this mother-daughter duo developed the essentials for longer, thicker, and healthier lashes. VIOLET GREY profiles female beauty entrepreneurs who are considered industry game changers because of their individual approach to business. Each one entered the conversation in her own manner and maintained a steady, if not unparalleled, trajectory with her indomitable spirit. Here, we talk to lash aficionado and LASHFOOD cofounder Faith Kim. Long, lush lashes are simple to achieve: You just need a skilled stylist to apply extensions. However, not everyone wants them. Lashfood launched in 2007 with Lash Enhancer, an Ecocert nourishing growth serum containing only skin-loving ingredients. “Many chemical-based enhancers will grow lashes, but they might become thinner and cause premature fallout because of the weight of extensions,” Faith says. “If you’re trying to extend the life of your extensions, make sure to use a plant-based formula.” Made with the brand’s proprietary complex of medicinal herb extracts and peptides, Lash Enhancer increases blood flow and feeds frail, brittle lashes so they can reach their maximum potential. According to Faith, initial results can be seen within four weeks, and full growth occurs in three to four months (1 cycle = 1 bottle). Clinical trials also have shown an increase of 63.19 percent in length alone by the end of one cycle. My bedroom and my office have complete opposite aesthetics. Once I enter my bedroom, I live in a robe and I try to relax as much as possible. My bedding, accent pieces, and furniture are all in cream and beige tones. I keep it minimalistic with clean lines mixed with natural elements. I’ve also been very into scents, so there are plenty of candles, palo santo, and an aromatherapy diffuser that I keep on at night (I also keep one on my desk at work). I live in an apartment in the Arts District and space is challenging, so I try to maximize by making every piece chic yet functional. For example, I have a large infinity mirror in my bathroom hallway that has hidden side cabinets that slide out and—ta-da!—a display of all my skincare and makeup products appears. When I have guests, I slide the cabinets out of sight. I have a low platform bed with four pillows that I sink into, a mattress topper, and Matteo crisp, cool bedding (I use vintage linen during the winter). I discovered them when I first moved to the Arts District years ago. They had a store across from my apartment, and I ended up going in weekend after weekend until I eventually redid my entire bed. Best investment ever. I’m a night owl. I get my best ideas and accomplish the most work at night when there are no disruptions. I usually get off work around 9 or 10 p.m. and fall asleep around 1:30 a.m. I’m basically in a different time zone. Around nine hours, but I usually get an average of seven or eight. Next to my bed are lip balm and LASHFOOD Phyto-Medic Lash Enhancer. One swipe of each and I’m ready for bed. I know I should say something like warm water with lemon followed by celery juice and then a green smoothie, but honestly, it’s just black coffee. On a good day, water. I hop in the shower, apply two drops of eucalyptus oil while the steam is going, and then use Ayur-Medic Anti Bacterial Wash with Exfoliating Beads all over my face and body. I try to get an exfoliating body scrub at a Korean spa once every other month, but when I don’t have time I use a Dermasuri exfoliating mitt. I have about 20 products that I’m currently testing, so every day-slash-week is different. I try to approach skincare as makeup replacing, so I’m usually makeup-free on a daily basis. I prep as much as possible at night so I wake up with dewy skin and supple lips. I haven’t always been like this, though. For more than half my life—from my teens until very recently—I would never leave the house without wearing foundation or some makeup, even if I was just picking up groceries. I’ve finally gotten to a place where I’ve learned to treat and love my skin. But on the days I do wear makeup, I have go-to products. Cover FX Natural Finish Foundation feels light with a dewy finish. I also use Auritaum Magic Contouring Powder in No. 1. I feel like I’ve tried every contour powder on the market, but this one does the job for Asian complexions and is only $10. On my eyes, I use 3CE Multi-eye Color Shadow Palette in Overtake and BROWFOOD Aqua Brow Powder + Pencil Duo in Taupe, which I’ll also use to intensify shadow. When I was in Japan, I also discovered Kate Liquid Liner (Japanese-made liquid liner brushes are the best). I use that with Kate Sharp Lock Gel Pencil to soften the liner. 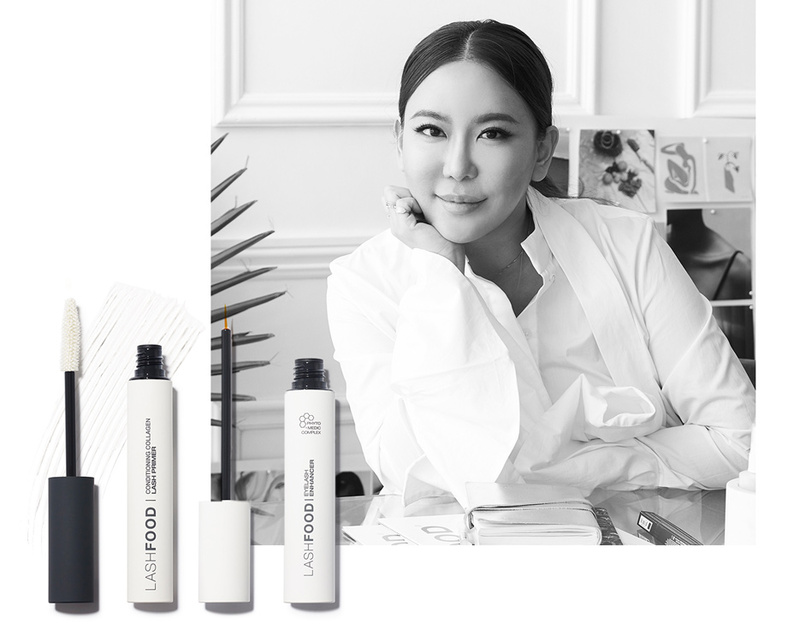 I clean up any mistakes and perfect using LASHFOOD Chamomile Makeup Eraser Pen, which works like magic to create a super sharp cat eye, perfected brow arch, or a flawlessly outlined lip. I’m super low-maintenance. I brush my hair in the shower with my wet brush, put it in a bun, and let it air-dry. By noon, I’ll let my hair down for a naturally wavy, but not frizzy, look. I scroll through Instagram, catch up on emails and Slack, and read the paper and my horoscope for the day with a cup of coffee. I like to take my mornings super slow, and I’ve been trying to ritualize my morning and nightly moments. I try to plan out my day and write down what I want to accomplish. It’s usually a mix of three big things and three small things. I leave at around 9:30 or 10, depending on the day and the meetings.